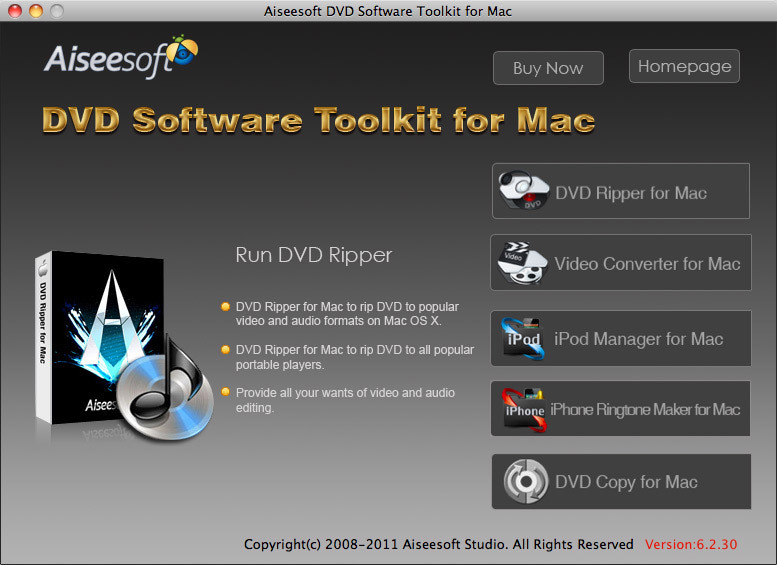 DVD Software Toolkit for Mac is both a Mac DVD Ripper and a video converter software - a suite pack with DVD Ripper for Mac and Video Converter for Mac combined. It is a Discount converter. It is everything you need to rip your DVD movies and convert your video files on Mac OS for iPhone, iPod, Apple TV, Zune, PSP, Xbox 360, PS3, iRiver, Creative Zen, Archos, PMP, Smart Phone, Pocket PC, PDA, cell phone, MP4 Player, MP3 player, and many other video and audio players. DVD Software Toolkit for Mac provides various practical features such as setting video brightness, contrast, saturation, selecting DVD subtitle and audio track, trimming DVD and video, and merging selected files into one file and so on. Rip DVDs and convert videos to all sorts of video formats and audio formats for playback on most portable video and audio players. DVD Ripper Pack allows you to merge and convert more than one DVD title (chapter) or video file in to one file. DVD Ripper for Windows is very easy to use. Ripping DVD to any format with this DVD ripping software is a just snap even for kids. Why choose DVD Software Toolkit for Mac?